Unique Astrology gift book gives humorous insight into Aries personality. Click Here! The Sun blazed in dynamic Aries, a fire sign, on your birthday. The Sun in astrology stands for your inner nature, the light of your essential character. Aries is the first sign of the Zodiac, a masculine sign ruled by the warrior planet Mars, whose motto must be "Crash through, or crash!". A cardinal (creative and inventive) sign, Aries the Ram governs leadership and initiative. Aries people are bold and self-confident, although they do tend to be overly impulsive. The Sun, the ruler of our inner nature, is very well placed in Aries, the sign of its exaltation. This energy is very attractive, even compelling, and few can resist being carried along in the jetstream. Ariens are always overflowing with ideas, schemes and plans to conquer the world, for a well-aspected Sun in Aries radiates power and vitality. Many a moth has been burned in its flame! Life, of course, is one long party (which the more mothlike among us may find a just little wearing...). Click this to test your compatibility with all signs, or check out these signs, the most compatible for relationships with Aries! Ariens are great organisers, full of flair and originality, although usually lacking discipline and the capacity for prolonged effort (minions must be found to do the slog work!). You are intuitive and articulate, with the capacity to inspire others, especially in projects which have a clear outcome and do not require a long lead-time. You have masses of energy and courage and will rush in where angels fear to tread, for the Arien ego can be rather overbearing. Ariens are risk-takers and love to take chances, whether in love, or in the slots online! Undue optimism, or impatience and desire for self-aggrandisement can result in wasted effort or even severe setbacks and disappointment. 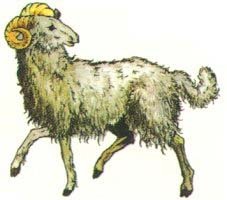 The emblem for Aries is the Ram, a determined fighter and a powerful adversary, with a strong urge to express himself over the widest possible field of endeavour. Is the grass greener on the other side of the hill? Of course it is, isn't it, Aries? Creative Aries, being a cardinal sign, loves to be the leader and can organise fantastic and impressive ventures. Unfortunately, despite your desire to be the front-runner in all you do, sometimes you do get bored with the whole affair and can just wander off, or sit back and allow the lesser folk to have their way. This can see the whole house of cards collapsing, but happily your enthusiam is easily roused and when you set your mind to it you can inspire others to stick to those essential jobs that sometimes seem no more than the merest details to the noble Ram. You see, painful as this may seem, you really need the team as much as the team needs you! Aries rules the head, brain and eyes, so people with Aries active in their charts are subject to head injury, headaches, general problems with organs in the head and fevers (although the nose is ruled by Scorpio). You are all extremists and for this reason can fall prey to stress-related ailments and mental problems. However, although you can be highly-strung, your great fund of energy enables you to survive where other less exuberant folks might succumb. Your colours are red and white. Aries rules metallic iron and your birthstone is the brilliant diamond, symbolising clear strength, purified under pressure. Nature creates precious diamonds out of crumbly, coal-black carbon, by applying intense heat and pressure for a very long time. 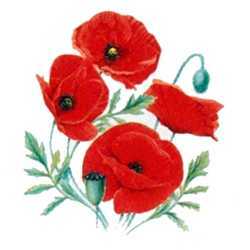 Flowers for Aries include the red poppy, geraniums, honeysuckle and hollyhocks.